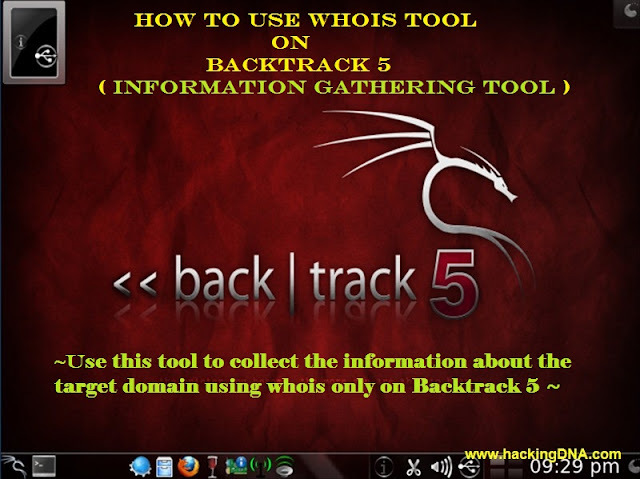 Whois : It is a tool that is used to collecting information about the target .The target would be any domain . It allows us to access information about our target Ip address or host names,Domain Name System (DNS) and contact information like address , phone number , email address etc . Here whois : It is the command . amity.edu : Its is the domain name . You can see when we give whois command certain information reflect on the screen regarding the amity.edu domain . Above image shows Administrative Contacts . Technical contacts - Address ,Phone number ,Pincode,E-mail address . it´s pre-installed in backtrack 5R3 this application? yes , you dont need to installed it, just you have to open konsole and use "whois" .